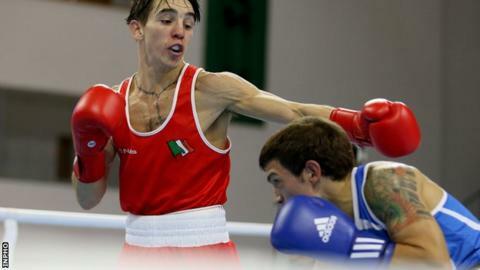 Belfast bantamweight Michael Conlan will fight for gold at the European Championships after a semi-final win over Francesco Maietta in Bulgaria. Conlan produced a dominant display against the Italian to earn a unanimous points decision. The 23-year-old will take on Britain's Qais Ashfaq in the final on Saturday. It will be a rematch after they fought in the Commonwealth Games final in Glasgow last year, with Conlan prevailing to win the goal medal. Conlan progressed to the European final after beating Maietta on a score of 30-27, 29-28, 29-28. His quarter-final win over Denmark's Frederick Jensen guaranteed a place at the World Championships in Qatar in October. Conlan won silver in the flyweight division at the 2013 European tests. The Belfast man's team-mate Dean Walsh had to be content with a bronze medal after losing his light-welterweight semi-final to Vitaly Dunaytsev. A third Irish boxer, light-heavyweight Joe Ward, beat Hrvoje Sep of Croatia and remains on course to regain the European title he won four years ago.